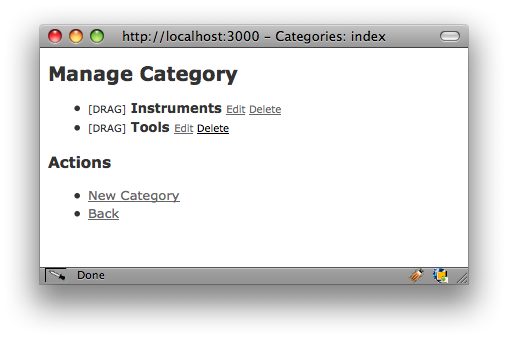 Yes, I've written another plugin for Rails. It's about so called root tables. It seem to be making them often. I want a list with options to choose from and some easy way to manage that list, which is a tedious task. That's why I made a plugin to do this for me. Let's take a tour of it's usage. 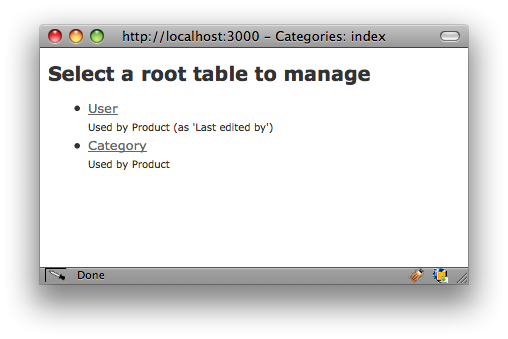 Let's add a configured root table for good measure. Let's convert the User-model to a root table. User is not a list, and doesn't have a name-field to recognize it, nor does it have a position field. It requires some options to make it work. The relation is called last_edited_by, it doesn't add any validations and the displayed (and thus sorted) field is login instead of name. It doesn't have position field, nor do I provide it, so it'll sort on login and won't be manually sortable, as we'll se in a bit. Using the User model might not be the best example, but you'll get the point. This is all done with a layout that Rails scaffold generates. If you have your own layout it might look completely different. 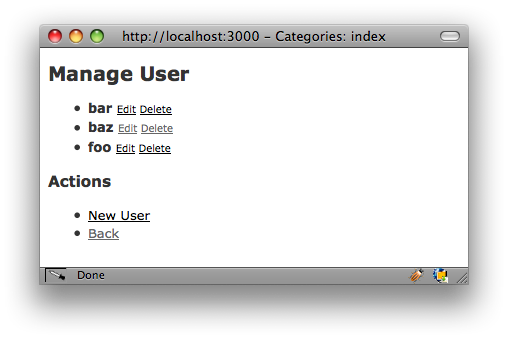 The management pages are a Rails engine. This means that you can override any file by creating a file with the same name in your app-directory. Have a look at the code to see which files you can override. You can also override views on a table basis. That means that you might want a view that is different just in case of one table. The form for new users might want to have more fields than just the login field, but also include password fields. 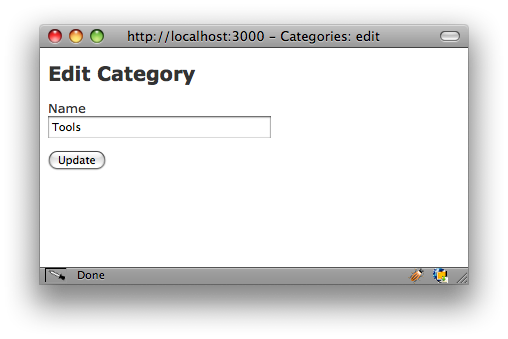 Create a view for that in app/views/root_table_contents/new_user.html.erb. Available for override per model are index, new and edit. That about wraps it up for root_table. Please provide me with feedback and report any bugs and improvements. You can use the comments on my blog, or the issues page on github. I've made some tiny updates, most importantly reducing the amount of magic. Rails does a very nice job of lazy loading your models which can lead to some strange errors with the previous version of my plugin. These should be fixed now. A model does not know another model exist in development environment. Mentioning a model is enough to trigger Rails autoload and even constantizing a string works. Sweet! Don't require a model again during a request. Some models will break. I found this to be the case with the session class needed by AuthLogic. Again, to know for sure that a model has been loaded, simply mention it in your code, usually that is enough. Tests are run in an environment very similar to production. I already knew that, but it's worth mentioning that a stable development environment is also essential and you might not catch that with unit tests alone.